This is a project that can seem quite daunting to the novice (and I am a novice as well). However, it is extremely enjoyable and immensely satisfying. 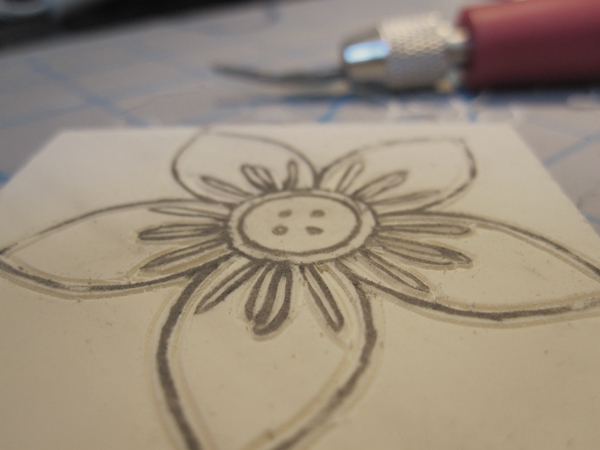 So, if you have the urge to try your hand at carving stamps, I strongly support it. As I mentioned, I am a newbie at this, but I thought I’d post a tutorial here to show what I am doing. 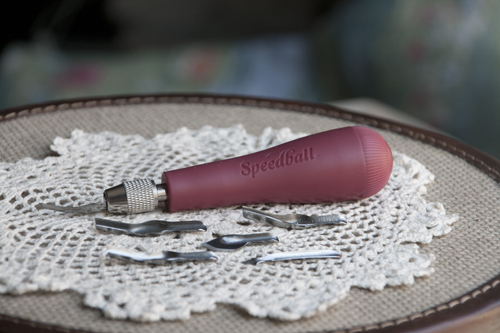 Speedball ‘speedy-cut’ (NB I find this produces stamps that are a bit too soft for my taste. However, I was attempting a design with some tiny crannies, and it’s much easier to cut through). First, find a design or an image that you want turned into a stamp. 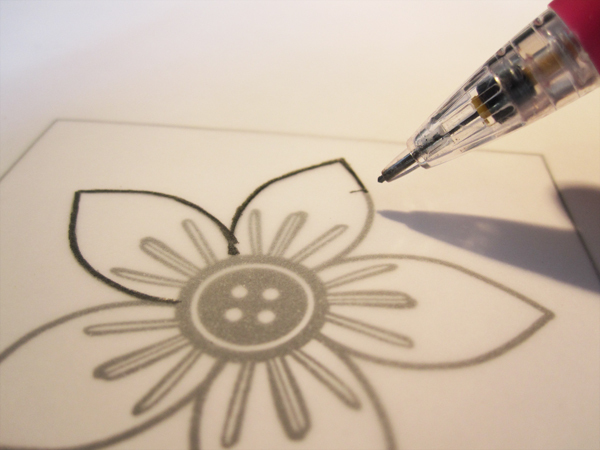 I drew my button flower in Illustrator then printed it out. Find a piece of tracing paper and trace the image, being generous in the amount of graphite that you are putting on the page. This is what you’ll transfer to your rubber pad. Cut out your tracing and place it face down on your pad. Then, using your fingernail or the nub end of your speedball cutter, rub all over your design (being very careful not to let it move). 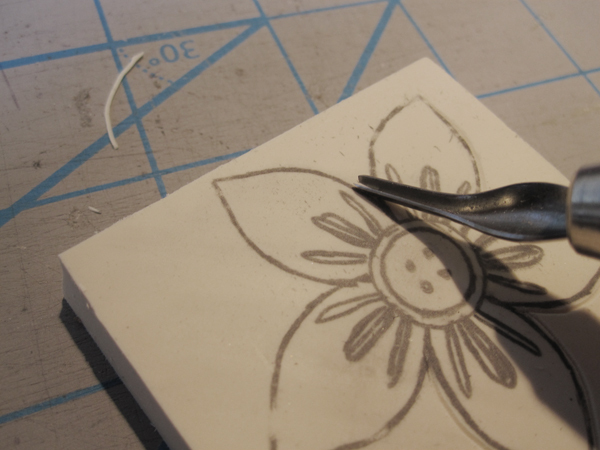 When you lift up your tracing paper you should have your image ready to carve. Start with your smallest tip and go all around the borders of your design. The cutters are extremely sharp and the incisions do not need to be deep, so you will barely have to apply any pressure at all. Once you have done this, take the next size up and clean out the rest of the empty space. Take your time. When you are satisfied, go ahead and carve away the exterior of your design. You’re done! trim away excess material around your design and try it out. You may notice that there is ink showing up in spots where you don’t want it, and that simply means you go back and take down those pesky bits. 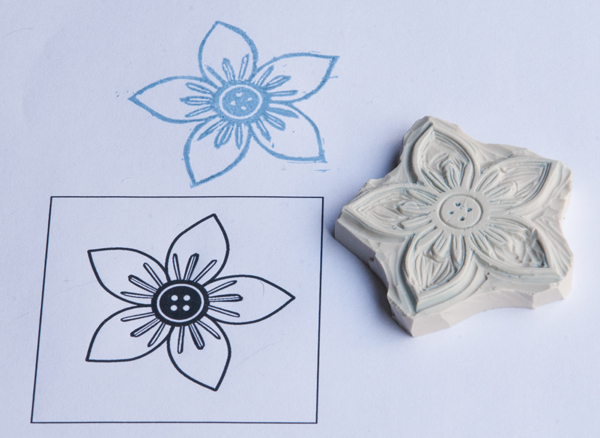 Here’s the finished button flower stamp. Nicely done! Would you consider gluing it to a block of wood to make a handle? How would you store a number of these? Certainly gluing it to a block of wood is a handy idea. This particular carving block is quite thick and therefore easy to get a grip on so I probably wouldn’t – but I am exceptionally lazy. If you were making a large number of these any medium storage would work. I keep them in a shoebox with a lid and I have a set of plastic storage drawers as well. Anything to keep the dust away. Congratulations on setting up a truly “lovely” website, Morgan. 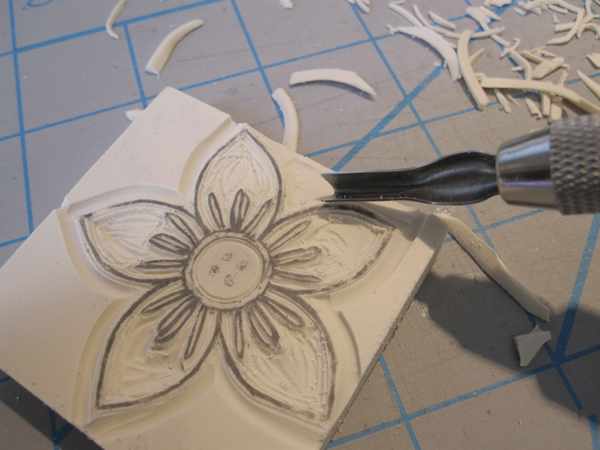 You’ve done an excellent job of describing the carving process in this exercise. I’m wondering…what do you use as the stamping ink? Is it easy to wipe off and reapply different colour inks? What about using more than one colour in a single stamping? Do you think it would be easy to do or would colours tend to run together where they touch? Celeste, Welcome! I’m glad you’ve enjoyed my website. I use the brand ‘colourBox’. I find they have a nice array of pigments to choose from, although any acid-free inks should be fine. A little bit of gentle scrubbing with warm soapy water removes the ink wonderfully. 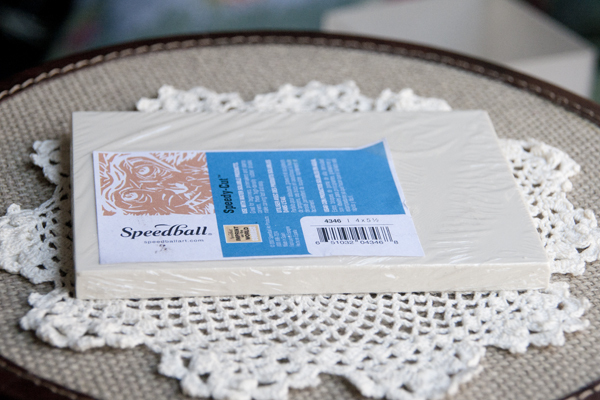 The Speedball carving block that I used in this tutorial does stain a little bit, but that does not affect the colours that are used subsequently. Just make sure that the stamp is fully dry before using again. I think that using more than one colour when stamping is a great idea, I don’t think the colours would run together at all unless you overlapped them in the inking process, which would be a deliberate choice. I’ll have to try it out and let you know how it goes!